From mandolions and rhinoboes to gorillutes and newtubas, twenty-six wacky alphabeasts join a musical safari. 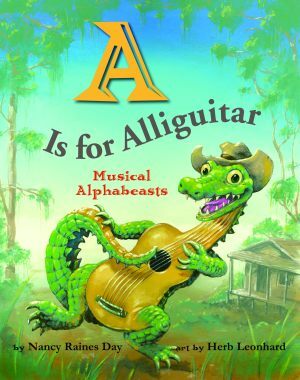 Through humorous rhymes, this book presents a cross between an animal and a musical instrument for each letter of the alphabet. A llama and maracas come together to create llamaracas, a lynx and a violin form the violynx, while the saxofox stems from a fox and a saxophone. Young readers will laugh at the zany illustrations. Nancy Raines Day is a freelance editor and a picture book consultant for the Society of Children’s Book Writers and Illustrators. After earning her BA in journalism from the University of Michigan, she earned a master’s degree in literacy journalism from Syracuse University. 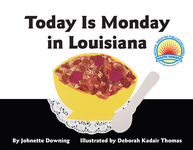 Day is a member of the Authors Guild and lives in St. Simons Island, Georgia. Herb Leonhard received a bachelor of fine arts in illustration from the Pacific Northwest College of Art. His award-winning work has appeared in D Magazine, among other publications. He is also the illustrator of Pelican’s Way Out West on My Little Pony, St. Patrick and the Three Brave Mice, A Southern Child’s Garden of Verses, Leonardo’s Monster, and I Know a Librarian Who Chewed on a Word. Leonhard lives in Prosser, Washington. Somewhere near you, on this hot and sweltering day, an alphabeast is lurking and rehearsing. Click here for Chapter 1. Click here for Front Matter. Click here for the study guide for this book.